There are some serious perks to being a Floridian! Sunny weather, live music, rich history and culture…and now, admission to three parks for only $99. This summer through Labor Day, guests will be able to enjoy access to three of Florida’s hottest parks with the Busch Gardens 3-Park Summer Sizzler. The Summer Sizzler pass is your key to unlimited admission to Busch Gardens® Tampa, and unlimited weekday (Mon.-Fri.) admission to Adventure Island® and Aquatica®, SeaWorld’s Orlando water park. How about that for unlocking unlimited adventure? Passes are valid from the date of purchase through Labor Day, September 2, 2013. Valid for Florida residents only (Photo ID required). 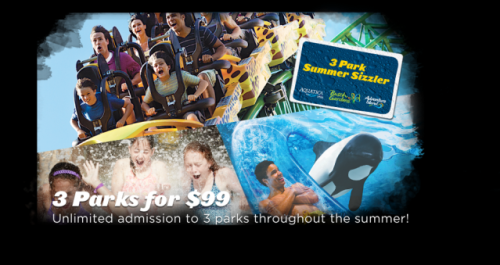 Take advantage of the Summer Sizzler online at BuschGardens.com or by calling 888.800.5447. Stay tuned for more ways to unlock discounted treasures in Tampa Bay!